Mark Twain's Huckleberry Finn is from Missouri, but the shrub whose name he bears is found in many different areas of the U.S. Varieties of huckleberry thrive around the nation, traveling under different scientific names. Most species of huckleberry look very much like blueberries, but each has its own preferred habitat. Only a practiced eye will be able to distinguish between blue huckleberries and blueberries. 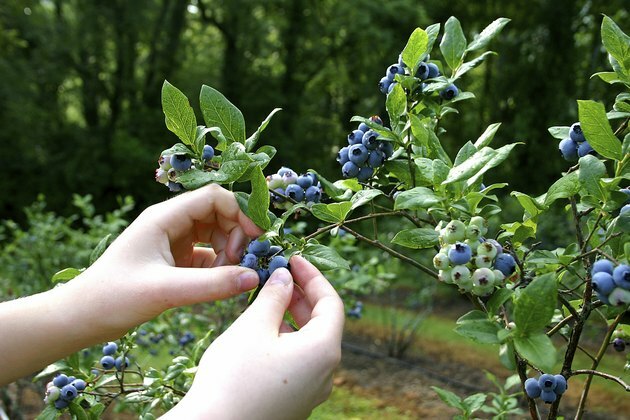 In fact, blueberry varieties are often incorrectly termed huckleberries. 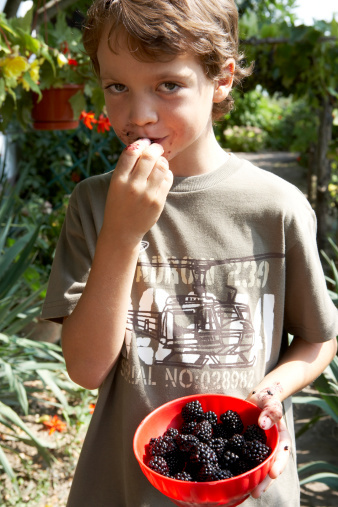 All you have to do is eat a few berries to be sure; huckleberries have 10 large seeds in each small fruit, so they crunch when you bite, unlike blueberries. Huckleberries also tend to be sweeter than blueberries. Both prefer acidic, loose, well-drained soil. Certain varieties of huckleberries also prefer shade. Huckleberries in the East are short, bushy plants, growing from 18 to 36 inches tall. They thrive in U.S. Department of Agriculture plant hardiness zones 7 through 9. 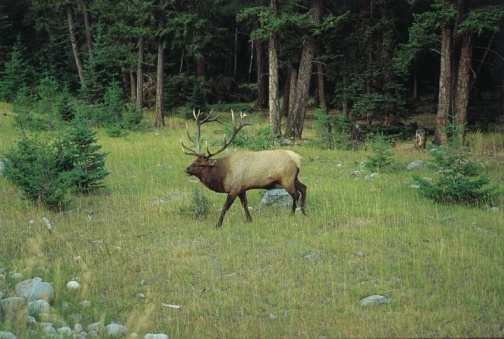 Two varieties exist in the wild, with different native growth areas. Look in pine forests in the southeastern coastal plain for Gaylussacia frondosa var. tomentosa, found most frequently in Alabama, Florida and Georgia. The second variety, Gaylussacia frondosa var. frondosa, is native to the Piedmont region of the Southeast. Huckleberries are a contradiction. They enjoy rocky hills and boggy, cypress swamp margins, but also thrive in dry woods and sandy pinelands where they have full sunlight in the morning and partial shade in the afternoon. In the Pacific Northwest, people, including the U.S. Forest Service, attach the common name of huckleberry to specific fruiting shrubs within the Vaccinium genus. For example, Idaho's state fruit is commonly called big, black or thin leaf huckleberry, which grows to 5 feet tall and prefers higher elevations: 2,000 to 11,500 feet above sea level. You'll find these huckleberry bushes in the wild in cooler mountainous areas like Alaska, Montana, and the Cascade and Rocky Mountains, where it grows as an under crop in subalpine forests. It is generally found on moist, moderately deep, well-drained soils in USDA zones 4 through 8. According to the University of Idaho, this shrub has never been successfully cultivated. As they thrive in full sun, look for mountain huckleberry bushes in clear cuts or places where the forest has experienced regrowth after a fire. The term "red blueberry" would be internally inconsistent, which may be why the common name for this red-berried bush is red huckleberry. This huckleberry is found in shady coastal forests and wetlands in the Pacific Northwest, generally prolific on old dead logs or broken trees growing some 10 feet tall and 6 feet wide. The shrub is fond of organic soil, and decomposing stumps provide the nutrients it requires. Look for smooth, rounded leaves and berries that ripen early, in the first days of summer. Berries are red and tangy, beloved by wildlife and good for jam. The red huckleberry grows best in USDA zones 6 through 8.